Why do I want to learn this? What’s in it for me? What am I expected to do? These are the questions that learners want to know the answer to, before they’ll even consider beginning to engage with a course. If I don’t know what’s in it for me, I won’t be switched on. If I’m not switched on, I’m not going to be motivated to do. If I’m not motivated to do, then nothing will change. You can forget about delivering any kind of measurable success if learners aren’t engaged in the first place. We need to look to develop the “me” aspect of our learning. Learners are more time-poor and easily disengaged than ever. They don’t just want learning to be a conversation that’s worth having – they need it to be. Self-actualisation – or “me-learning” – should be our new paradigm. Here’s three steps to making it happen. First of all, we do this by allowing learners to discover what’s in it for them, how they can develop a better “me”. To instigate this process, we’ve been working with a variety of self-diagnostic activities given at the head of the learning process. A “self-diagnostic” is any exercise that asks learners to honestly evaluate how they’re currently performing. Superficially, this may appear to look like extra testing; learners are quizzed before they begin a course, quizzed throughout it, quizzed at the end. The same approach applies to everyone: death by quiz. But it’s the exact opposite, and I’ll explain why. Imagine the captain of my five-a-side team has told me I need to score more goals. I’ve decided that I’m going to access an elearning course that has the objective of making me more like my hero Gareth Bale. At the outset of the learning, I want to emulate Gareth Bale’s performance as closely as possible. That’s the desired improvement. But do I already know how I compare? I might I have a good idea, but have I actually thought about it in depth? Have I considered all the facets of my game that need to be perfected in order to reach that “Gareth Bale” level, the desired end state? A well designed self-diagnostic activity should map directly on to the desired end outcome for the learning. In this instance, a self-assessment that asked me to honestly rate myself against the “Bale scale” would allow me to benchmark where I was right now, and what I would need to improve, develop or discover in order to reach the desired end outcome. Alternatively, it could be that I’m a HR manager and I’m taking a course on developing my understanding of talent management techniques and processes, and the self-diagnostic shows me that whilst my understanding of the process is very good, I find it harder to actually recognise and rate talent. This isn’t designed to catch learners out, but to encourage an initial process of self-actualisation. It’s three considerations; “here’s where I am”; “here’s where I could be”; “this is what I need to do to get there”. From this point, I as a learner have a good idea what I need to improve. So now I’m entering into the actual learning, what do I expect to see? I want to see content that’s relevant to me and techniques that I can personally apply. If the “Bale scale” shows me that I’m good at scoring but my passing isn’t the best, what good is it if the learning I’m presented with is then weighted to how I can score more rather than how I can improve my passing? Not much. What I want is to access interactions that allow me to have a go at improving my passing, feedback as to how I did so I understand why I’m going wrong, and guidance as to how I could do it better if I did poorly the first time around. So the content delivered needs to really reflect the results of my self-diagnostic, but I also want that content itself to be designed to be relevant to me. If I want to be like Gareth Bale and I play in the Spanish League, I want to test myself and see scenarios that are relevant to my background. That means it might be interesting to see how I’d fare against players in the German or the Italian leagues, but what I learn won’t generate the improvement I’m looking for if the examples aren’t relevant to my working life, or why I’m going wrong at present. This is at the core of what we’re calling “me” learning – showing learners a pathway to a “better me”, designing content to support that improvement and encouraging them to discover their own approach. But how do we really make the improvement happen? We need to personalise the output of learning, giving people practical advice that they can take away from the course and apply continuously in order to support growth and development in the areas where they’ve recognised they have a need to improve.That’s how you turn 40 minutes of learning into 40 weeks of action. So I’ve identified that my passing is not at the level of Gareth Bale (yet). I’ve identified where I’m going wrong, practised getting it right and learnt how I can get there. But how does that translate into more goals for me and my team? Here’s how. At the end of the course I’ve been able to build my own tailored personal action plan using tips that have been suggested, allowing me to take what I’ve been doing onscreen and start applying it off screen. I’ve got downloadable guides showing me the key output of what I’ve learnt so I can access it when I’m in the changing room before the match, and calendar reminders throughout the week that suggest times when I should be practising my passing. The captain of my five-a-side team would be able to evaluate the success of my training on a continuous basis by taking a look at how many goals I was scoring, or how many I was creating for teammates, and we could look at ways that this could be further supported in future once we’ve had a chance to measure the improvement. It’s not about defining the learning design on a learner-by-learner basis, but allowing the flexibility and mechanisms for the learner to personalise content to suit them and their own requirements. This generates an improvement that benefits them as an individual, strengthens their skillset in accordance with the business need, and ultimately delivers measurable ROI as a result of this improvement. You may never quite measure up to the Bale scale. But make your elearning a little more like “me-learning” and you’ll certainly score more goals this year! Now a senior project manager in the wider world, Nick was an acclaimed instructional designer and project manager who worked on a variety of topics for a wide range of Saffron’s clients, including AAT, BNP Paribas, BT, Deutsche Bank, PwC and Telefónica, working closely with subject matter experts in order to deliver effective and engaging content that, above all, effects the desired behavioral change. 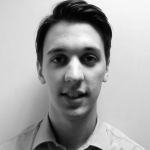 Nicholas has extensive experience working with clients on systems and process based training. He has an in-depth knowledge of instructional design and learning strategies and is known for building strong client relationships and developing multi-lingual courses.